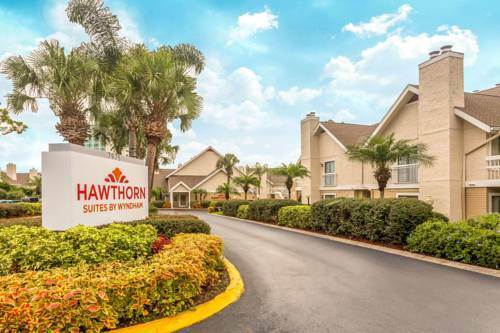 Hawthorn Inn and Suites Orlando International Drive hotel is a great choice for an International Drive Orlando hotel near the Orange County Convention Center and is convenient to the famed theme parks of the city including Walt Disney World, SeaWorld, Universal Studios as well as great shopping malls. Enjoy scheduled shuttle service to Universal Studios, Sea World and Disney World. This Orlando extended stay hotel offers all suite accommodations with studio, 2 double beds and 2 story penthouse suites. Find room to roam in our International Drive hotel suites that are least 50 percent larger than the standard hotel room. Our Orlando extended stay hotel features separate working, dining, and sleeping areas as well as full kitchens and free high-speed Internet access. Enjoy new signature bedding with brand new mattresses and linens. Enjoy complimentary hot breakfast daily and join us Friday evenings for social hour. Stay in shape with our exercise room, outdoor heated pool, whirlpool and Sport Court. Feel the comforts of home at our pet friendly hotel. Accessible rooms are available and kids stay free through age 17 when accompanied by an adult. · American Dollars is the native currency. "Visit Jerusalem in Orlando!" proclaim promos for this 15-acre replica land of the Bible. Costumed historical interpreters, New Testament landmarks. Former 15-ft. long terror of the lakes around Mount Dora, now a fun outdoor gator-ridin' photo-op. A 200-foot-long alligator-shaped building named "Swampy." Outer space. No, you're not going -- but you can see the pile of stuff left by those who did. © RoadsideAmerica.com, Doug Kirby, Ken Smith, Mike Wilkins. Information provided as an unofficial resource on attractions as a convenience to our visitors.